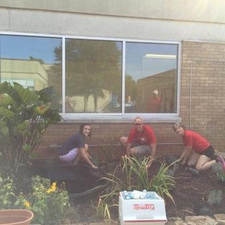 The staff of the Concord Branch of Carolina Farm Credit recently purchased materials and helped the Central Cabarrus High School FFA improve the school’s landscaping and greenhouses. Along with landscaping, the staff also purchased and delivered school supplies to be used in the classroom. “Supporting our rural communities has been a part of Farm Credit since the very beginning, and projects like this are just another example of how Carolina Farm Credit gives back to the communities in which we work and live.” Vance Dalton, CEO, Carolina Farm Credit. This community service project is part of a Carolina Farm Credit initiative implemented by Carolina Farm Credit’s Community Diversity and Inclusion Committee. Each branch location is being offered the chance to participate in community service projects throughout the year. Carolina Farm Credit serves over 9,200 members with loans outstanding totaling more than $1.4 billion. The association’s territory covers the western half of North Carolina, with branch offices located in Albemarle, Asheboro, Asheville, Boone, Browns Summit, Burnsville, Carthage, Concord, Conover, Ellerbe, Graham, Hendersonville, Jefferson, Lenoir, Lexington, Lincolnton, Monroe, Murphy, Pilot Mountain, Roxboro, Rural Hall, Salisbury, Shelby, Siler City, Sparta, Spindale, Statesville, Taylorsville, Waynesville, Wilkesboro, Yadkinville, and Yanceyville. Directors for Carolina Farm Credit are L. Kim Starnes, Chairman, Salisbury; W. Rex Bell, Vice-Chairman, Statesville; John M. Barnard, Statesville; E. Bernard Beck, Seagrove; Mark A. Bray, Lawsonville; David M. Coltrane, Pleasant Garden; Susie J. Gambill, Sparta; Joseph A. Lail, Shelby; Clark M. Newlin, Haw River; Thomas E. Porter, Jr., Concord; Tony L. Ragan, Sanford; D. Kaleb Rathbone, Waynesville; Lewis E. Smith, Lincolnton; Vickie N. Smitherman, East Bend; Dr. Alton Thompson, Summerfield. Content courtesy of the Carolina Farm Credit Press Release.